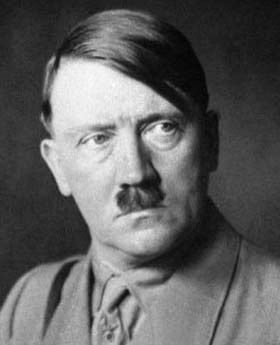 Austrian born, Adolf Hitler would rise to become the leader of Germany and one of the most hated men in all of history. Born in 1889, Hitler fought in World War I. The peace imposed on Germany after that war angered him, and the rest of his life he sought to reverse the peace that had humiliated his adopted country. In 1919, he founded the National Socialist Worker's Party, and in 1923, he was imprisoned for the Munich Putsch. In 1930, because of the severe economic downturn that he blamed on the Jews, his party won several seats in the German legislature. He used fear and intimidation, particularly the Brownshirts, to consolidate and maintain power. He established the SS, the Gestapo, and Concentration Camps, where Jews and those opposed to Hitler were sent. Hitler began the war in Europe in 1939 when German forces invaded Poland in a blitzkrieg attack. He then invaded France and his neighbors to the North, but failed to subdue Great Britain, who defeated the Germans in the Battle of Britain. In 1941 he invaded the Soviet Union (Operation Barbarossa) and pushed all the way to Moscow before the Russians were able to stop him. Because of Hitler's refusal to give up any land all ready taken, the Germans suffered defeats at Stalingrad and the Battle of Kursk. The British and Americans also pushed him out of North Africa. In 1944, the Allies landed at Normandy in France, and pushed the Germans further and further back, liberating Europe as they went. Hitler, in one last act of desperation, launched an offensive that became known as the Battle of the Bulge. While the Germans made initial successes, they were eventually halted and forced to retreat. In April 1945, with the Soviets in Berlin and the Americans pushing forward in the west, Hitler committed suicide, along with his long-time mistress and wife for a day, Eva Braun. Germany surrendered May 8, 1945.